The recent drought and ‘Day Zero’ scenario that reared its head in Cape Town in 2017, is seemingly something of the past given the relaxation of water restrictions recently announced and improved rainfall over the past winter rainy season. But is the ‘Day Zero’ scenario really behind us? What have we learnt from the past that better equips us to deal with ongoing future pressures related to water in Cape Town? It was of course not only Cape Town affected by drought since 2015, as much of the other parts of the country experienced similar challenges. South Africa is very much a dry country, ranked as the 30th driest country in the world, a claim that’s based on its average annual rainfall of 500mm compared to the world average of 860mm. Furthermore, 50% of its water is generated by 8% of its land, and adequate water supply is very much dependent on receiving enough rainfall in these catchments. The key challenge Cape Town experienced in 2017 was the fact that its catchments only received well below average rainfall over the 3-year period (2015 to 2017). One of the key measures that allowed the city to stave off the ‘Day Zero’ scenario was the introduction of water use restrictions of 50 litres per person per day (vs the global average of 185 litres per day), with punitive tariffs for those that exceeded it. In addition, water supply to agriculture was also curtailed with farmers having to cut their consumption by 40%. These measures, coupled with the fact that rainfall in South Africa returned to just below its average annual rainfall pattern, has certainly bought the city some time to come up with more sustainable water management approaches. So, what are the key challenges that need to be addressed for such a sustainable water management approach in South Africa to take root? 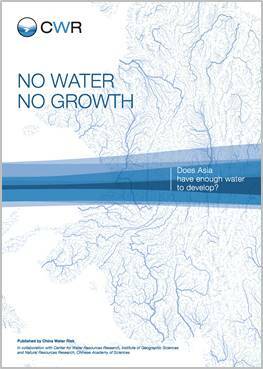 One of the key challenges is to address the gap between water supply and demand. At present, there are significant governance challenges in dealing with augmentation schemes in South Africa, coupled with limited demand-side management investments. Another challenge is to ensure a clear integrated water management strategy encompassing all spheres of government with clear lines of accountability. One of the embarrassing ongoing failures of the water situation in South Africa is the finger pointing and political point scoring that characterised the public discourse during the water crisis. Too often political and official lines are blurred in South Africa, and the sooner clear governance arrangements are adhered to and enforced, the sooner the notion of the developmental state and its ability to deal with a range of issues, can be addressed. Moreover, water management and land management are integrally related, yet despite significant investments in dealing with catchment management through managing invasive plants, rehabilitating wetlands and dealing with other forms of land degradation, there remains a hesitance to factor these costs into water management. A conservative estimate indicates that around 38 million cubic metres of precious water each year can be secured by clearing invasive plants (that use more water than native vegetation) in key water catchments. In addition, dealing with wetland rehabilitation (acting as natural water filters) and erosion management introduces water quality benefits that ultimately further support any sustainable water management strategy. 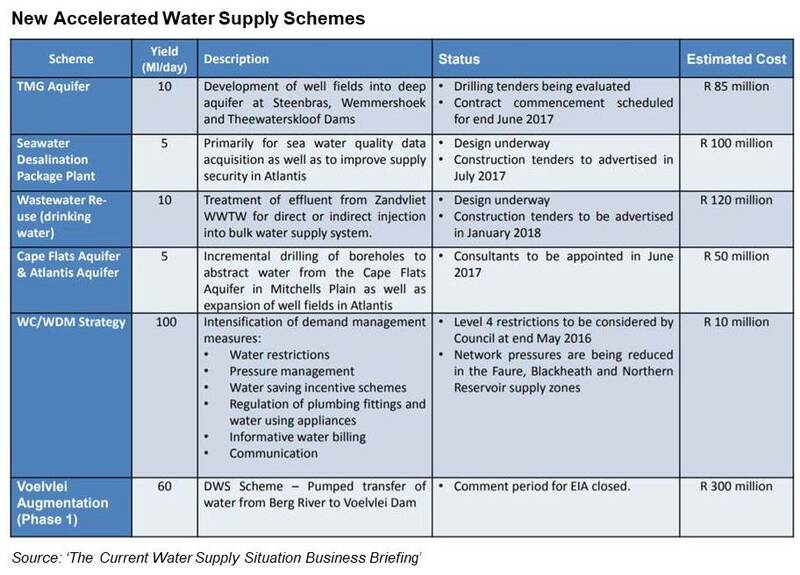 Although the City of Cape Town did initiate some tariff setting measures to discourage water wastage, there remains a number of additional components to factor in. These factors will ultimately ensure that those who drive up the marginal cost of supplying water, pays for it. For many Capetonians, the city’s response to the crisis was not always consistent, with very little real incentives to encourage water saving (eg. subsidised retrofits of water saving devices and provision of water storage tanks to lessen the demand on supply), and somewhat muted policy measures to encourage water neutral developments. In many of the more affluent neighbourhoods and business districts, the pace of new developments remained unabated with very little information on measures being implemented to ensure these developments are guided by some “water neutral” targeting. The raft of measures proposed instead were primarily aimed at households and water supply investments, some of which remain largely untested in terms of an effective water sustainability approach (see below). It should also be remembered that the City is facing a significant balancing act in ensuring its entire suite of services needed to run the city does so against the backdrop of this ever-changing natural resource scenario. There has also been a recent shift to rethinking the water infrastructure footprint of the city in terms of grey and storm water usage, but these remain in its infancy at present. Interestingly by the city’s own admission in the table below, conservation and demand-side measures are by far the most effective mechanism to boost water resources, but still receives the least budgetary importance. There remains a lot of work to be done to ensure we address humanity’s ongoing requirements for natural resources, and to ensure a transition to a more sustainable footprint is implemented fairly. If anything is to be learnt from the ‘Day Zero’ scenario it is the need to break new ground in ensuring that we understand the inter-related components when it comes to water management, and to ensure greater accountability of the institutions set up to manage these issues. The role of every citizen is key, and finding our collective voice to shape how our institutions and governance structures are able to deal with our future needs, will become more and more important. 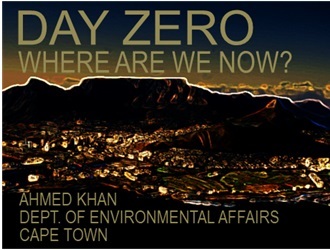 Ahmed Khan has been working in the Natural Resource Management Programmes, which is now part of the Department of Environmental Affairs (Environmental Programmes branch), in Cape Town since 1998. He has been serving in various implementation and management roles and is currently managing the Planning, Research and Capacity building components of the Programme. Mr. Ahmed Khan continues to live in the hope of assisting in establishing an effect management, research and implementation interface within the environment and development challenges facing South Africa.